November 19, 2018. The Marble Center Distinguished Seminar series will feature Dr. Timothy Rebbeck, the Vincent L. Gregory, Jr. Professor of Cancer Prevention Professor at the Dana Farber Cancer Institute and the Harvard T.H. Chan School of Public Health. Dr. Rebbeck leads an early detection effort at the T.H. Chan School of Public Health, and is looking to engage the technology community around these challenges in the context of cancer. His research also focuses on the prevention of cancer, with an emphasis on cancers with a genetic etiology and those that are associated with disparities in incidence or mortality by race. October 22, 2018. This month's Marble Center will feature an overview of PanCancer Atlas presented by Dr. Robert Kruger from Cell Press. The PanCancer Atlas is a detailed genomic analysis on a data set of molecular and clinical information from over 10,000 tumors representing 33 types of cancer. The entire collection of papers comprising the PanCancer Atlas are available through a portal on Cell.com. Dr. Kruger is Deputy Editor at Cell. He joined Cell in 2005 with a research background in biochemistry and cell and developmental biology. He holds degrees in Biology from the University of Sussex (MPhil) and in Neuroscience (Ph.D.) from the University of Michigan, where he trained in the laboratories of Kun-liang Guan and Jack Dixon. May 21, 2018. The Marble Center kicks off this year's Distinguished Seminar Series with a lecture by Dr. William Sellers entitled "From Cancer Dependence to Cancer Therapeutics." Dr. Sellers is a Core Institute Member at the Broad Institute and a Professor of Medicine at the Dana-Farber Cancer Institute and Harvard Medical School where he runs a research group focused on translating genomic discoveries into new therapeutics. Previously, Dr. Sellers directed cancer drug discovery and early cancer clinical development at the Novartis Institutes for BioMedical Research overseeing scientists, clinicians and clinical staff on sites in Cambridge, East Hanover, Basel and Shanghai from 2005-2016. Since joining Novartis in 2005 the oncology research group brought more than 30 small molecule, biologic and cell-based cancer therapeutics into first-in-man trials including therapeutics targeting the PI3K, CDK4, IDH, ABL, SMO, HER3, ALK, Wnt, PIM and Ras pathways among others. During his tenure, he conceptualized and directed the collaboration with the Broad Institute on the Cancer Cell Line Encyclopedia, the development of the Novartis Primary Derived Xenograft Encyclopedia and large-scale efforts to functionally characterize the cancer genome. Along with Dr. Carl June, he co-chaired the CART collaboration with the University of Pennsylvania that brought CTL019 to a recent FDA approval. Associate Member of the Broad Institute. Together with Matthew Meyerson, he initiated and developed large-scale efforts to resequence genes in diverse cancer types. In addition they pioneered the use of high-density SNP arrays for defining LOH and copy number alterations across cancer including the development of the widely used GISTIC algorithm. These projects led to discovery of EGFR mutations in lung adenocarcinoma and the discovery of the oncogenic role of the MITF gene in melanoma. In addition, his work advanced the understanding of the molecular mechanisms of growth regulation of the PTEN tumor suppressor gene. Dr. Sellers was a member of the National Cancer Advisory Board. Dr. Sellers received his B.S. from Georgetown University in 1982 and M.D. from the University of Massachusetts Medical School in 1986. He completed residency training in Internal Medicine at the University of California San Francisco in 1989 and trained in Medical Oncology at the Dana-Farber Cancer Institute. December 18, 2017. This month's Marble Center seminar will feature a hot topic on the emerging trend of preprint in life sciences. The discussion will be moderated by a Dr. Rosalind Mott, Scientific Editor at Cell Press. More background on the topic can be found in this recent publication in the journal Science. Dr. Rosalind Mott received her Ph.D. from The University of Virginia in biomedical engineering, investigating integrated cellular responses to applied force. She then moved to the University of Pennsylvania to determine the impact of traumatic brain injury (TBI) on mRNA translational mechanisms. This work led her to research neuronal network remodeling and develop therapeutic strategies to target aberrant protein translation and mitochondrial dysfunction to facilitate network recovery after mild TBI. She joined the Cell Metabolism editorial team in December 2015 and has a strong interest in transforming traditional modes of scientific communication. October 30, 2017. This month's Marble Center seminar will feature a research update by Dr. Ana Jaklenec from the Langer lab on "Drug Delivery Technology for Pulsatile Release of Biologics," as well as an industry panel on "Emerging Technologies:"
Dr. Andrew Warren is a Founding Scientist & Product Development Lead at Glympse Bio, a seed-stage startup developing a diagnostic drug platform originally invented in Professor Sangeeta Bhatia’s lab at MIT. Dr. Pengpeng Cao is a Senior Scientist at Torque Therapeutics where she develops new classes of cell-based immunotherapeutics to boost the potential of immunotherapy for cancer treatment. Dr. Vyas Ramanan is an Associate at Third Rock Ventures where he focuses on new company formation and due diligence. Dr. Fiona Sharp is an Investigator in the exploratory immune-oncology group at Novartis. Her research focuses on enhancing our understanding of immune checkpoint pathways for the development of anti-tumor immune responses. Dr. Jenna Sullivan is a Senior Imaging Scientist at inviCRO, LLC. where designs and directs preclinical and translational imaging studies to support drug discovery and development. Dr. Carl Schoellhammer is the co-founder and CEO of Suono Bio, a preclinical-stage company focused on the ultra-rapid delivery of novel therapeutics to the gastrointestinal tract. Dr. Michael Look is a senior scientist at Pfizer’s Inflammation and Immunology Research Unit, where he develops novel targets related to the treatment of autoimmune diseases and inflammatory disorders. October 9, 2017. The Marble Center announced today the first class of Convergence Scholars. The Convergence Scholars Program aims at cultivating in postdoctoral trainees an integrative vision of science and technology. The program will provide postdoctoral trainees with opportunities to further their experiences and skills beyond the research laboratory space. Click here to access the press release. May 30, 2017. Dr. Polina Anikeeva, the MIT Class of 1942 Associate Professor of Materials Science and Engineering, will present her research on "Probing Neural Function with Electronic, Optical, and Magnetic Materials" at the next Marble Center Seminar on Tuesday May 30, 2017 (5pm). More information about Dr. Anikeeva's research group can be found here. April 20, 2017. 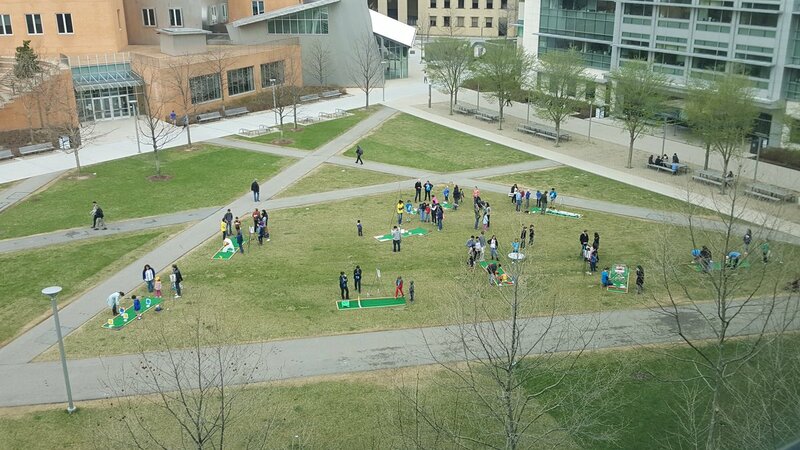 As part of the Koch Institute's outreach effort at the 2017 Cambridge Science Festival, Marble Center researchers designed a pop-up mini golf course on cancer nanomedicine featuring concepts from the fields of targeted drug delivery, nanoscience, tumor biology. Kids and adults took a swing at various biomedical challenges in this course (as well as several others organized by Koch Institutes researchers) to learn more about the ins and outs of cancer. November 15, 2016. Dr. Ji-Ho (Joe) Park will be presenting his research on "Harnessing Exocytosis of Nanoparticles to Improve Cancer Nanomedicine” on Tuesday November 15, 2016. Dr. Park is an Associate Professor of Bio and Brain Engineering at Korea Advanced Institute of Science and Technology (KAIST, South Korea). Lunch will be served at 12:30pm and the talk will start at 1pm. Click here for more information. October 9, 2016. In honor of the first annual celebration of National Nanotechnology Day, the Koch Institute for Integrative Cancer Research at MIT presents an interactive peek into how researchers across the MIT campus are using nanomaterials to explore and improve the world. Open the collage below for a big picture view of the tiny technologies exhibited in the Koch Institute Public Galleries. Each square links to one image in our online galleries; click to learn more!